Morgan Stanley investment banker James A. Runde discusses his book on emotional intelligence. Knowledge@Wharton: Some people are great workers but, for some reason, are not able to put it all together to have that phenomenal career. I’m guessing you’ve seen a few cases of this in the course of your professional career, correct? Runde: That’s exactly right. During the course of my 40-plus years at Morgan Stanley, I sat through thousands of promotion decisions for people moving up, and the No. 1 stumbling block was one of three things. Either they weren’t adaptable, they were not good at collaborating or they didn’t click with clients. In other words, they could not create empathy with clients. The three key words in terms of emotional intelligence for me are adaptability, collegiality and empathy. What I found was that EQ was the secret sauce to career success. Runde: I think an easy way to look at it is that there are cognitive skills, there’s work ethic and then there’s this third dimension of soft skills or emotional intelligence. Cognitive skills and work ethic are very easy to measure. Emotional intelligence is more difficult to measure. In my experience, the professional service firms, the banks, the law firms, the accounting firms and the consulting firms don’t do a good job at the front end in terms of screening for emotional intelligence. What they do is they screen for cognitive skills, grade point average and work ethic, and they figure that over time they’ll sort out who’s got the soft skills to succeed. But unfortunately, those people, when they start out, don’t realize that the soft skills are going to be the differentiators. At the front end, in the beginning, it’s adaptability. Over time it becomes much more about networking and team building and bringing in business, and that requires clients to like you and to trust you, which has nothing to do with your cognitive skills. Knowledge@Wharton: In this book, you break down careers into the early portion and the back half of the career. The early part deals with kind of that build up that you’re referring to, and the back half is more about dealing with the clients and being perceived as somebody that can really get the job done. Runde: That’s correct. In the early phases of people’s career, the very first thing is adapting from the academic world to the business world. In the academic world, the teacher has the answer and is there to help you. In the business world, the boss is expecting you to come up with answer and you’re expected to help the boss, so everything’s turned on its head. Some people have trouble making that first adjustment, they keep expecting their boss to give them the answer or give them a job description. Over time, people need to learn not only about dealing with bosses but dealing with different kinds of projects, juggling projects, finding mentors — finding sponsors. There’s a difference. And that’s just to get them to the next level, which is they’re good in terms of processing business that other people bring in these different categories of professional service firms. Now they need to make another shift, another pivot, because now they’re not trying to keep their boss happy, they’re trying to find clients and bring in business and keep clients happy. Completely different set of soft skills. Knowledge@Wharton: Many would say that the second half of the career ends up being as important as the first half. With the first half, you’re learning so much. But there’s almost an expectation that once you get to the second half, you have to have all of those first-half skills in place or else your value to the company goes down. Runde: That’s correct. But also, you can’t be in the office and doing your own spreadsheets, and out on the road bringing in business at the same time, so you also need to delegate and train and develop the junior people underneath you so that they can be doing the details, the deadlines and the data to give you the leverage to go out and bring in the business. Knowledge@Wharton: In terms of the early part of a career, you say that if you aren’t a team player and you complain a good bit, that’s going to really hurt your career. Runde: It’s almost like kindergarten. Works and plays well with others. There’s a terrific book called Wisdom of Crowds in which the basic point is that all of us are smarter than any one of us. The person who thinks in this complex, fast-paced, global world that they can do the business and bring in the business all by themselves is setting themselves up for failure. The big firms don’t want a lone wolf. They want a team player. Knowledge@Wharton: You mentioned those three “Ds” that you bring up in the book: deadlines, details and data. How much has the data part overtaken the other two because of this digital world that we live in? Runde: There’s no question that data is like a firehose. When I first started the business, we only had one computer and data entry was by punch cards, if you even know what those are. Things have changed a lot, and now clients and customers have access to the same data as anybody else. With virtual reality, artificial intelligence and big data, the trick now is to find a way to turn data into insight. Clients want custom-tailored insight. They already have the data. They’ve got too much data, so the way you add value today is you create insight. The example I give in the book is you take a piece of information, you put it in context of what’s going on with the client, you do some quantitative analysis, and then you add some judgment. The combination of those factors turns information into insight, and that’s what clients want. Knowledge@Wharton: Most people don’t have these soft skills coming out of college. I would think that now it should be something they are developing while in school because they have to hit the ground running when they come into the real world. Runde: It would be great if they did develop them in school, but what I’ve found is that in the recruiting process, soft skills are under-assessed. In other words, they’re not properly measured. Once people get hired, they are often slow to be developed by the human resources people. Only when there is a problem, only when somebody gets passed over for promotion, does a person realize that they undervalued, underappreciated how much the soft skills were going to be the differentiator. Because every person at these high-powered firms has a great work ethic and a terrific grade point average and went to great schools like Wharton. But not every Wharton graduate does as well as the next Wharton graduate. They’ve all got the same degree. What is the differentiator? What I’ve learned is it’s one of these three things: adaptability, collaboration or empathy. Some of these people are complete rocket scientists, but they can’t work in teams or clients don’t want to work with them. Knowledge@Wharton: You have to have tough skin to survive in the work place. Perhaps empathy is one that doesn’t fit in this group? Runde: I think the adaptability and collaboration is much more inside the company, and the empathy is on the outside of the company. What I’ve learned is that clients look at the big firms — the banks, the law firms, the accounting firms — and because of the crash of 2008, all of those big firms have all consolidated. They’re all global. They’ve got all great technology, so it’s much more competitive. It’s much more difficult for the clients to differentiate among them. What I’ve seen and am seeing is the clients, therefore, go for the person they like and they trust. Knowledge@Wharton: The notion of the two halves of a career has been discussed. The way the economy is working in this digitally transformed world, there is always going to be an overlap of the two. You are not just going to be selling, but you’ll probably have to also go back to the drawing board and learn from the scratch because the technology is changing at such a fast pace. How do you marry the two thoughts in the world of EQ? Runde: That’s a terrific question, and you’re absolutely right. There is a learning aspect to it and a leadership aspect to it, and I would put a third dimension in there, which is a client aspect or dealing with customers. Learning and leading is more internal. Customers and clients are external. But there’s no question that all three of those overlap. I would say that an important attitude is to have continuing education. In other words, nobody can be a know-it-all. Things are moving too quickly today. The other thing that I’ve had to learn is that I need upward mentoring. The younger people coming out of Wharton and other great schools are the ones that teach me the apps, teach me analytical techniques, which really helps me keep my game sharp. It’s not only continuing education, but it’s being willing to be coached and trained by people starting out, not just people above you. 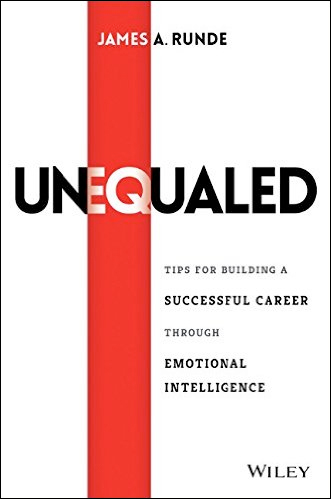 Knowledge@Wharton: There’s a lot to learn from this book for the person who is starting out their career, but there are also lessons that people into that second half may not think about on a daily basis. Runde: One of the things I talk about in the book is there are two different kinds of listeners. When you are working with clients, there are the people who listen to respond, and there are people who listen to listen. The person who listens to respond is basically the kind of person who can’t wait to get the microphone, and their sentence with the client or customer starts out, “Yes, but.” They’re basically an intellectual show off. And that person leaves the meeting with their swagger and their arrogance intact, but no business. The person who listens to listen is the person who is able to get the client to keep talking, almost like peeling the onion. The client realizes that that listener is trying to understand the problem, trying to help. The more the client talks, the more the listener understands the problem and is able to solve the problem, and that’s the person who leaves a meeting with an order, an assignment. Nothing about swagger or arrogance, but rather that kind of humility, that kind of empathy, pays off big in terms of new business. Knowledge@Wharton: You also talk in the book that as people go along in their careers, they should take a personal assessment. I think a lot of people do that from time to time, but maybe they don’t do it often enough? Runde: I think taking a personal assessment is a very important thing to do. You don’t want to be a navel gazer, but you want to take stock of how happy you are with your boss, how happy you are with your job, with your resources and your responsibilities. Think about what you can do, what could you change. Then figure out, in talking to your boss and your mentor, what are the things you could do to make yourself happier. What I have found is that will make you more successful. I think another part of personal assessment is having some peripheral vision. What are the things that other people at your level are doing that you are not doing? Not in a competitive sense but just as an assessment sense. What kind of projects are they doing, what kind of extracurricular things are they doing, what kind of people are they working with, what kind of clients are they working with? You have a sense of where you stand. Knowledge@Wharton: You also talk not only about finding a mentor but also finding what you call a sponsor, or that ultimate person to have your back in the corporate structure? Runde: That’s a very important point. I developed that quite a bit in detail in the book because everybody knows about networking and everybody knows about mentors. A mentor is somebody you talk to, kind of a coach. But a sponsor is even more important because a sponsor is someone who talks about you, who speaks up for you in promotion decisions or speaks up for you in terms of senior leaders. A sponsor is the person who will have your back and make sure that you get the best shot in terms of getting ahead. That’s different than a mentor. A mentor can be like a secret Santa Claus no one knows about. A sponsor is going to have to be out there speaking up for you. Knowledge@Wharton: Dealing with the client meeting is something that a lot of people in the early part of their careers don’t get involved in. I get the sense that it’s almost a skill you need to pick up on the fly. Runde: It is a very important skill, and I think when you’re starting out the more you can find your way to get invited to watch a senior person do a client meeting, it’s almost like an apprenticeship. You can see how they handle it. You can see how they persuade, how they sell, how they negotiate. But you can also see how they start and finish. A professional person who goes into an important client meeting and starts out by talking about news, weather and sports is a person who is not well prepared. A person who at the end of the meeting says, “OK, thanks for your time. See you next time.” That’s a very weak finish. A professional person needs to know how to sum up. “Now that we’ve learned the question, now that we understand more of what’s on your mind, I’m confident that we can do a great job for you, and we will back with a proposal next Tuesday.” That’s a strong close. You see the difference? Knowledge@Wharton: Now, I’ll let you sum up the book and the key elements that people need to consider in terms of emotional intelligence for their careers. Runde: What I learned over 40 years is that emotional intelligence is the secret sauce for career success. I say that based on sitting through thousands of promotion decisions and seeing that people struggled not because of their cognitive skills, not because of their work ethic, because everybody has great cognitive skills and great work ethic. But it was either adaptability, collaboration or empathy that caused people to stumble. And there is a way to take your game up on soft skills or emotional intelligence, and that’s why I wrote the book. Where would Steve Jobs be on the EQ spectrum? Or Wharton alum President-Elect Trump? Would it matter?